the time of writing – follow on Facebook and Twitter to get the updates, details below). In addition, our special guests for the evening are Vince Lee and the Big Combo. This will be a fantastic evening of live music and we look forward to seeing you there to help us celebrate the launch of the album. There’s a lot of interest in the event and tickets are on sale now. In addition you can obtain tickets direct from Russell at any of his shows or by sending a message to us on this website using the contact form or dropping us a message on Facebook or Twitter (the account details are included at the end of this note). On the night, physical copies of the album will be available for purchase to ticket holders at a discounted price of £7. After the event the regular price will be £10. To help people attend the event who are travelling from Plymouth we have arranged free return transport. via several minibuses on a first-come first-served basis. It’s the intention that pick up will be around 7pm from a central location in Plymouth with the return buses leaving Rumleigh Farm around midnight. Final details will be confirmed once we better understand the likely number of people interested in this service. please DO NOT assume the seat is available. We will post updates on this website plus Russell’s music Facebook page and Twitter feeds. Connect to them for updates if you’re not already, details are included below. We will also post to advise if/when all seats are filled. If demand for seats exceeds supply we will compile a reserve list for those who requested a seat but were unlucky. This list will match the order in which the requests were received. Any seats that become available will be offered to those on the reserve list in the same order. 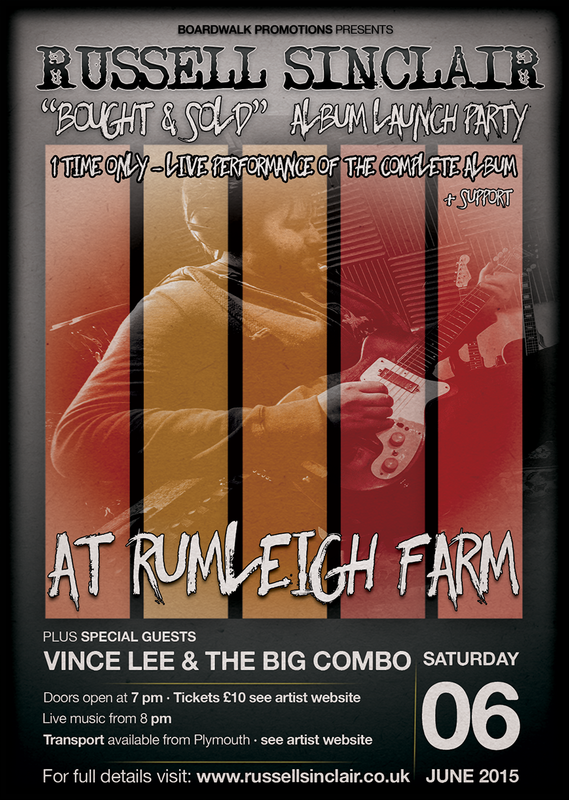 You are of course free to make your own travel arrangements to/from Rumleigh Farm for the event if you would prefer that – the site is well posted and there is parking available at Rumleigh Farm for private vehicles.